Marine turtles are often called the ancient mariners of the sea. They have been swimming in the ocean for more than 150 million years, first appearing during the age of the dinosaur. Turtles have changed little since then, maintaining an aquatic existence and only coming ashore to lay eggs, producing another generation to swim the seas. One of the highlights of a visit to the Great Barrier Reef is spotting a marine turtle. Of the seven species of marine turtle, six are found in the waters of the Great Barrier Reef Marine Park. 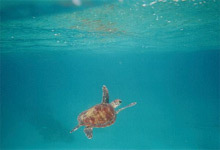 Green, hawksbill, and loggerhead turtles are the most frequently sighted. Visitors to the Marine Park have also spotted flatback, leatherback, and olive ridley turtles. Although a turtle's shell may make it look ungainly or slow on land, the shell is low-domed, streamlined and relatively light, which allows a turtle to glide easily through the water. The shell also protects the turtle and helps it float. Turtles swim with strong, fin-shaped front flippers, which allow the animal to move quickly through the water, whilst its rear flippers enable the turtle to steer and to dig an egg chamber. same region where they were born. loggerhead (above) and green turtles (below). Most will travel north to mate and lay eggs. Turtles ingest large amounts of salt because they swallow seawater while foraging. Special glands beside the tear duct on the eye excrete the excess salt, giving the appearance of 'tears' when turtles are on land. Between November and February, female turtles come out of the water to nest on land and lay several clutches of eggs. Once they've finished laying, the mums return to the ocean. Turtle hatchlings dig their way out of nests between January and April and head straight for the water as fast as they can. Many hatchlings do not survive their first day. Some are eaten by ghost crabs, feral pigs, and foxes before they even reach the water. Others are taken in the shallows by gulls, fish, sharks, and crocodiles. Only a small number of hatchlings get the chance to become adults - it is estimated that about 1 in 1000 hatchlings survive to adulthood. Flatback turtles only nest on Australian beaches and are the most commonly seen turtle species nesting on mainland beaches in the Mackay Region. Different species of turtles feed on different things. Green turtles eat primarily algae and seagrass; loggerhead and olive ridley turtles eat shellfish and crustaceans; hawksbills eat algae and sponges; and flatbacks eat sea pens, sea cucumbers and soft corals. Leatherback turtles feed almost exclusively on jellyfish. At all stages of its life, a marine turtle is vulnerable to predators. 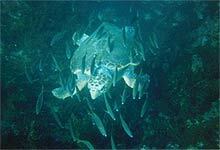 Young and adult turtles can be attacked by large cod, groupers, sharks, crocodiles and killer whales. Current human pressures on turtle populations in Great Barrier Reef waters include bycatch in commercial fishing gear (e.g. trawl nets), traditional hunting, habitat degradation, boat strikes, bycatch in shark control program gear, and ingestion of or entanglement in floating rubbish such as plastic bags and fishing line which, if eaten, can block a turtle's stomach. Lights from coastal and island development (particularly street lights) can confuse new turtle hatchlings, causing them to move inland from their nest, instead of moving out to sea. While they are protected in their breeding grounds of the Great Barrier Reef, marine turtles face a number of threats from human-related activities within and adjacent to the Great Barrier Reef Marine Park. Because turtles are long-lived, slow growing, late maturing animals, their population can take many decades to recover. Marine turtles continue to play an important part in the traditions and cultures of Aboriginal and Torres Strait Islander people living along the Great Barrier Reef. Turtles (almost entirely green turtles) are hunted in the Great Barrier Reef World Heritage Area. The combined marine turtle hunting mortality in Australia and neighbouring countries is thought to exceed the capacity to replace losses, particularly for the northern Great Barrier Reef green turtle stock and hawksbill turtles. When visiting beaches on the coast or islands of the Great Barrier Reef, switch off lights so that nesting turtles are not disturbed and newly hatched turtles won't be confused. When visiting islands, keep pets at home. Dogs and cats can destroy turtle nests and kill hatchlings. Don't throw any rubbish into the sea! Turtles can become entangled in fishing gear and mistake floating plastic bags for food. If you're in a boat, make sure the driver slows down in shallow water. Turtles and other marine animals may be feeding. Do not feed, touch or alarm a turtle, for instance by loud noise or sudden movements. Immediately report any sick, injured or dead turtles to the Marine Wildlife Hotline on 1300 360 898 (local call cost).